Ken is now eighty-years old. His large leathery hands are defined by the lifetime spent as a farmer and mill worker. Ken took up viticulture at the age of forty-seven, more for “fun money” than out of necessity. It also was a family activity. The grandchildren helped by putting a fertilizer tablet into the ground beside each of the vines on nearly four acres. Thirty vineyards dotted the Moab landscape in the early 1980s. The Roberts’ four acres are the last remaining of those that were started. “Most residents didn’t realize the extent of the hard work involved. They thought they could just pick the grapes with one hand and put the money in their pocket with the other,” says Arlis. 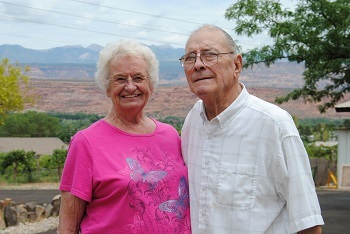 Arlis and Kent Roberts started growing grapes for wine in Moab 35 years ago. 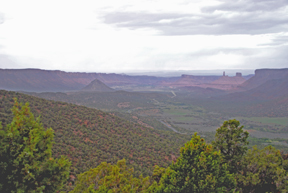 The test plots proved that Moab has favorable conditions for growing wine grapes. The sandy loam is ideal. The cold desert evenings are also excellent for providing the sufficient stress required to produce unique flavor nuances. But few farmers had the know-how of proper pruning techniques and long-term care of grape vines. And it turned out, Napa Valley wineries didn’t line up to buy the grapes grown by Moab farmers. Will Fryer head tends to the vineyard. Working together, Arlis and Ken planted 2,800 grapevines ranging from Cabernet grapes to Petite Sirah. They worked together for four months in the evenings after work digging holes and pounding cedar posts into the ground so that each vine could be trained along wires. They did the job right. 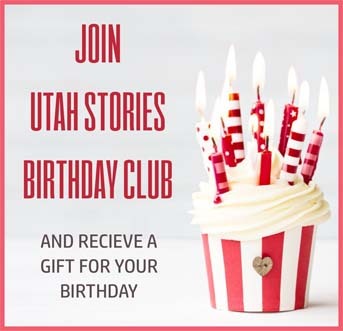 At peak production, the Roberts harvested 19 tons of grapes, and up until just a few years ago, they were receiving big paychecks from a relatively new operation in town: Castle Creek Winery at the Red Cliffs Lodge. Well-tended vines can produce for decades. This is good news for Will Fryer, Castle Creek’s head vintner, who has been learning the business for the past seven years. Fryer planned to grow his own wine grapes on the banks of the Colorado River at Red Cliffs Lodge. However, the soil conditions and extremely hard water made the endeavor nearly impossible to achieve, so Fryer has managed to continue to produce his award winning wine by relying on the Roberts’ hard work. 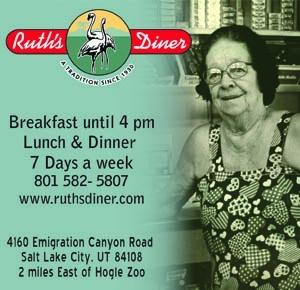 Fryer purchased the Roberts’ vineyards and has hired a full-time viticulturist, Mary. 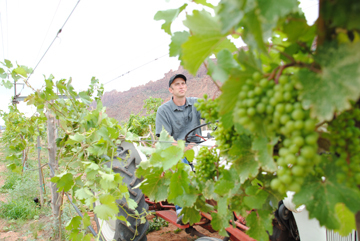 Beginning this year, a large percentage of the grapes they use will come from Utah. Fryer expects that in the next few years, the vines will again reach their peak and again produce close to 20 tons. Castle Creek wine is having a hard time keeping up with demand, and the awards are rolling in by the barrelful. They are currently bottling 14,000 gallons of wine per year, they expect to be up to 20,000 gallons within the next year.